Abstract | Since the beginning of human civilization many herbs have so far been used for the treatment and management of various ailments. Spreading of bacterial resistance against antibiotics is consider one of the common problems in the medical world, so one of the most important steps in microbiological researches is to find a new antimicrobial compound with minimal side effects. One of wild herbs was Acacia ehrenbergiana Hayne commonly known as Salam, which was used as animal grazing herb especially camels, sheep and goat. Due to that it seems that this plant may contain considerable antimicrobial capacity. So the aim of this study is to investigate the antimicrobial activity of Acacia ehrenbergiana Hayne aqueous extracts on some medically important animal pathogens and to determine some phytochemical compounds. Hot and cold aqueous extract of Acacia ehrenbergiana Hayne were evaluated for their antimicrobial activity against some medically important pathogens isolated from animals and poultry farms (Staphylococcus epidermis, Escherichia coli, Streptococcus pyogens, Pseudomonas aerogenes, Salmonella typhimurium, Enterococcus, Bacillus cereus, Klebsiella pneumoniae and Candida albicans) by agar well diffusion method. Both hot and cold aqueous extract showed high antibacterial effect against the all examined pathogenic bacteria samples. While the extracts did not show any significant antifungal activity against Candida albicans. Also, phytochemical compoud of aqueous extract was determined, results of the chemical tests explain the extracts of Acacia ehrenbergiana Hayne contain alkaloids, flavnoids, tannins and saponin compounds. So it could be concluded that the Acacia ehrenbergiana Hayne extract possess remarkable antibacterial activity against gram positive and gram negative bacteria and to be introduced as an alternative to chemical antimicrobial drugs, is required wider investigation. Keywords | Natural antimicrobial, Acacia ehrenbergiana Hayne, New antifungal, Salam, Grazing herbs. Citation | El-Desoukey RMA (2018). Phytochemical and antimicrobial activity of acacia ehrenbergiana hayne (salam) as a grazing herb against some animal pathogens. Adv. Anim. Vet. Sci. 6(6): 246-251. Copyright © 2018 El-Desoukey. This is an open access article distributed under the Creative Commons Attribution License, which permits unrestricted use, distribution, and reproduction in any medium, provided the original work is properly cited. Microbes are the most common cause of infectious diseases which participate in about half of the deaths in animals. In addition to the major cause of morbidity and mortality in many developing countries which mainly due to diarrhea, which are most commonly due to Escherichia coli (E. coli) and Salmonella spp. (Parastoo et al., 2012; Rehab, 2015; Rehab, 2017) Also Staphylococci is considered the main cause of subclinical mastitis caused by intramammary infections common in dairy cows. (Rehab, 2015; Rehab, 2017; Thorberg et al., 2009). Diarrhea in neonates are associated mainly with several entero-pathogens. Their relative prevalence varies geographically, but the most prevalent infections in most areas are Escherichia coli, rotavirus, corona virus, and Cryptosporidium parvum. More than one of these etiological agents are commonly associated leading to neonatal diarrhea outbreaks. (Rehab, 2015; Rehab, 2017; Merck and Dohme, 2014). Also systemic fungal infections due to Candida albicans which play an important role as a cause of morbidity and mortality. (Rehab, 2015; Rehab, 2017; Beuchat and Golden, 1989). Bacillus cereus was identified as an in frequent abortigenic agent in cattle. Necrotizing placentitis with no or sporadic lesions in fetal tissues (Rehab, 2015; Rehab, 2017; Schuh and Weinstock, 2009). Klebsiella pneumonia is a common cause of clinical mastitis in dairy cattle and the main source are wood products. (Rehab, 2015; Rehab, 2017; Mnouz et al., 2006). In the present time, interesting in the using medicinal plants to dominance the growth of the pathogenic microorganisms, due to a large number of chemical antibiotic were costly and exhibit side effect therefore, the award people are turning towards herbal antimicrobial (Rehab, 2015; Rehab, 2017; Abd El-Latif et al., 2002) and the synthetic medicament have been banned in the world because of their undesirable attributes such as high and acute, long degradation periods (Rehab, 2015; Rehab, 2017; Buchanan et al., 2008). Bacteria resistance of antibiotics that may occur due to, a) active transport system deficiency b) reduction of membrane permeability, which makes the antibiotic concentrations do not perform active in bacterial cells (Rehab, 2015; Rehab, 2017; Duraipandiyan et al., 2006). Also, antibiotics had residues in animal products (Rehab, 2015; Rehab, 2017; Buchanan et al., 2008). For this, trying to find alternatives to antibiotic. In accordance to what had been mentioned by World Health Organization (WHO), more than 80% of the world’s population depend on traditional medicines for their requirements of primary health care. The plants medicinal value depends on its content from chemical substances which produce physiological action on human body. The most important of these bioactive compounds of plants include alkaloids, flavonoids tannins and saponins. An effective approach of the phytochemical research generally in the discovery of new anti-microbial from higher plants (Rehab, 2017; Duraipandiyan et al., 2006; Kanife and Odesanmi, 2012). For instance, Acacia ehrenbergiana is a tall shrub or small tree, seldom exceeding 4 metres (13 ft) in height. It is much branched, the trunk has dark brown, shaggy bark and the branches are green or brown with shiny, peeling bark. The compound leaves are small, with up to four pairs of pinnae, each with eight to twelve pairs of pinnules. Growing in the leaf axils are paired white thorns which are up to 6 centimetres (2.4 in) in length and longer than the leaves. (Le Houerou, 2013). It is an important fodder plant for camels, goats and sheep and the flowers are visited by bees which make Acacia honey from the nectar. (Le Houerou, 2013). The timber is used for charcoal and firewood, the bark for fibre to be wound into ropes, and the sap produces a low quality gum which oozes from damaged parts of the trunk. An ointment is made from the plant’s ground up tissues. (Le Houerou, 2013; Contu, 2012). Acacia ehrenbergiana Hayne (Mimosaceae) is distributed in north and east Africa and contains Gallic acid, methyl gallate, rutin, myricetin, quercetin, myricetin 3- O -(3 ‘’’ - O -galloyl)-β-D-rutinoside and catechin were isolated (Gaara et al., 2008). It is used in medicine as emollient (Le Houerou, 2013). The synergetic drugs or in combination with conventional antimicrobial agents can be used as new antimicrobial agents. The need to develop novel one become urgently. So that, it is important to identify the new antimicrobial of locally available plants and to demonstrate its composition phytochemicaly to create a proper documentation. So the aim of this study is to investigate the phytochemical and antimicrobial activity of, Acacia ehrenbergiana Hayne aqueous extract as a grazing herb against some medically important animal pathogens (Staphylococcus epidermis, Escherichia coli, Streptococcus pyogens, Pseudomonasaerogenes, Salmonella typhimurium, Enterococcus, Bacillus cereus, Klebsiella pneumoniae and Candida albicans) by agar well diffusion method. 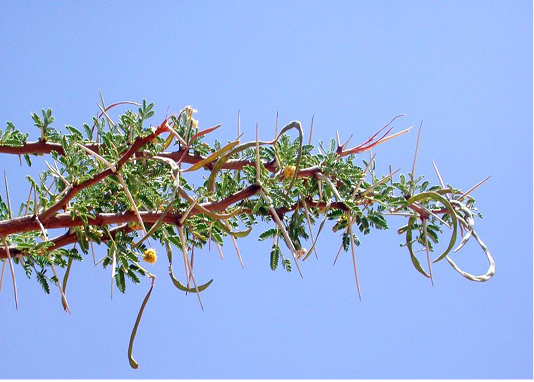 Figure 1: Desert grass Acacia ehrenbergiana Hayne (local name Salam) (http://plantsofsouthernmorocco.biota-africa.net). Acacia ehrenbergiana Hayne (Salam) used in this study were obtained from local farm in Alquieiya, KSA, 2016. Distilled water was boiled, dried plants were added to the water and left to cool. Then were mixed by the blender and filtered to get clear aqueous extracts. The extracts were kept at 4°C until to be use. But the hot aqueous extract has been prepared directly after boiling and filtration according to (Rehab, 2017) . The inoculums (bacterial strains and fungi) were isolated from large animals and poultry farms on the outskirts of Cairo. The strains of bacteria (Staphylococcus epidermis, Escherichia coli, Streptococcus pyogens, Pseudomonasaerogenes, Salmonella typhimurium, Enterococcus, Bacillus cereus, Klebsiella pneumoniae) & fungi (C. albicans) were inoculated Sabaroud dextrose agar (SAB) (Purchased from Witan – Biolife Company produced by Jalil Medicals Company) & nutrient broth (Purchased from Witan – Biolife Company produced by Jalil Medicals Company).for overnight at 37 °C for bacteria & 25 °C for fungi according to (Rehab, 2017). The agar well diffusion method was used for the determination of antibacterial activity of Acacia ehrenbergiana Hayne (Salam) aqueous extracts by using bacterial isolates taken from animals and poultry (Staphylococcus epidermis, Escherichia coli, Streptococcus pyogens, Pseudomonasaerogenes, Salmonella typhimurium, Enterococcus, Bacillus cereus, Klebsiella pneumoniae) & fungi (C. albicans) to evaluate its effects on the isolated bacteria. Loopfull growth from bacterial isolate was inoculated into nutrient broth incubated at 37 °C for 18 hours. The dilution of bacterial suspensions with normal saline. Adjust the turbidity and compare with standard tube (McFarland number 0.5) to get a uniform suspension containing 1.5×108 CFU / ml. Muller- Hinton agar was inoculated with 0.1ml of bacterial inoculum .Using cork borer, wells were made on the cultured media. The aqueous extracts were considered as the 50% concentration. Then, 0.1ml of aqueous extracts were added to wells, then the plates left for 30 min in refrigerator at 4°C, thereafter, they were incubated at 37°C for 24 hrs. The activity of aqueous extracts was determined by measuring the diameter of inhibition zone in millimeter. All experiments were duplicated. Ciprofloxacin (10 µ g) and penicillin (10 µ g) used as positive control while distilled water (100 µg) used as negative control for antibacterial screening aqueous extract. Nystatin (10 µg) was used as positive control while distilled water (100 µg) used as negative control for antifungal screening .All chemicals used (Purchased from Witan – Biolife Company produced by Jalil Medicals Company) (Rehab, 2017; Kanife, 2011). Tannins Test: A modified methods stated in (Rehab, 2017; Kanife, 2011) was used to be presented oftannins on the extracts, Afew drops of Ferric chloride reagent were added for 3 ml of extract. A blueblack color refereed to the present oftannins. Alkaloids Test: A few drops of Marqus reagent (prepared from mixing 0.5 ml of Formaldehyde with 5ml of concentration H2SO4), added to the 5 ml of extract. Turbidity refereed to the present of alkaloids (Rehab, 2017; Ajoku et al., 2015). Saponins Test: 3 ml of extract was added to the 2 ml of Ferric chloride, a white residue to be formed as evidence to the present of Saponins (Rehab, 2017; Doss et al., 2011). FlavonoidsTest: Flavonoids test were implement in conformity with (Rehab, 2017; Doss et al., 2011). 2ml of extract mix with Alcoholic KOH (0.5 mol. ), a yellow color as proofed to the present of Flavonoids. Glygosides Test: 0.5g of grinded Acacia ehrenbergiana Hayne (Salam) was dissolved in 2ml of glacial acetic acid containing one drop of Ferric chloride solution, and then under laidwith 1 ml of concentration H2SO4A brown ring indicated the present of Glycosides (Rehab, 2017; Antia et al., 2010). All chemicals used (Purchased from Witan – Biolife Company produced by Jalil Medicals Company). Table 1: Antimicrobial activity of Acacia ehrenbergiana Hayne (Salam) aqueous extract against some animal pathogen in (mm). 2017). Antimicrobial agent must suppress or destroy microbial growth; thus susceptibility of the microorganisms, penetration of antimicrobial agent to the infected site, adequate concentration of the agent, low toxicity of the host cell, lack of micro-organism development of resistance to the agent are necessary (Rehab, 2015; Rehab, 2017; Mahon and Manuseli, 1995). So the aim of this study is to investigate the phytochemical and antimicrobial activity of , Acacia ehrenbergiana Hayne (Salam) aqueous extract as a grazing herb against some medically important animal pathogens (Staphylococcus epidermis, Escherichia coli ,Streptococcus pyogens, Pseudomonasaerogenes, Salmonella typhimurium, Enterococcus, Bacillus cereus, Klebsiella pneumoniae and Candida albicans) by agar well diffusion method. All plants used in the traditional medicine mostly have moderate antimicrobial activities as reported earlier (Rehab, 2015; Rehab, 2017; Chung et al.,1993; Chung et al., 1998; Sasikumar et al, 2005; Alkhazaragi, 1991). The previous study with C. procera has been shown that the plant has antibacterial and antiparasitic activities (Larhsini et al., 1999). Recently, Rahim et al. (2016) studied the antimicrobial activity of methanol extract of A. ehrenbergiana which showed a wide spectrum activity against bacterial isolates but a poor inhibitory activity on fungi. These results clearly show that high extract concentration has high antibacterial activity. (Rahim et al., 2016). Considering the above results, the results obtained showed that the hot and cold aqueous extract of Acacia ehrenbergiana Hayne for their antimicrobial activity against some medically important pathogens isolated from animals and poultry farms (Staphylococcus epidermis, Escherichia coli ,Streptococcus pyogens, Pseudomonas aerogenes, Salmonella typhimurium, Enterococcus, Bacillus cereus, Klebsiella pneumoniae and Candida albicans) by agar well diffusion method. Posses high antibacterial effect against the all examined pathogenic bacteria samples. While the extracts did not show any significant antifungal activity against Candida albicans. The presence of biologically active constituents such as alkaloids, tannins, saponins and flavonoids in leaf and florets though in varying percentages might be responsible for the antimicrobial activity. Also the potency of leaf extract when compared with stem and floret could be due to high percentage of alkaloids and saponins in the extract. Alkaloids have been reported to posses antimicrobial activity against organisms such as klebsiella pueumonia and Candida albican (Rehab, 2017; Kanife and Odesanmi, 2012). The Terminalia citrina extracts tannin content causes inhibition of cell wall formation leads to death of fungi. (Rehab, 2017; Le Houerou, 2013). However, non- inhibition of Candida albicans and Aspergillus flavus suggests resistance of these fungi to the active component present in the leaf extract. Also (Kanife and Odesanmi, 2012; Okokon et al., 2011) reported the antimicrobial activity of tannins through coagulating the protoplasm of the microorganism. Biological function of flavonoids includes protection against allergies, inflammation, free-radicals, platelet aggregation, microbes, ulcer, hetatoxins and tumors (Rehab, 2017; Kanife and Odesanmi, 2012). This may be explained by its activity against the test organisms. Also ithas been reported by (Rehab, 2017; Kanife and Odesanmi, 2012; Mahon and Manuseli, 1995). that flavonoids are responsible for anti microbial activity of some other medicinal plants. The absence of alkaloids, tannins and saponins in the extract may be responsible for its non-activity against all the organisms tested. In this regard, the study was performed to investigate the phytochemical contents of Acacia ehrenbergiana Hayne. All phytochemical tests results indicated that the aqueous extract most abundantly contained alkaloids, flavnoids, tannins and saponin compounds in addition to glycoside was yielded from extract as shown in Table (2). Antimycobacterial properties of the herb could be due to the abundant saponins, and tannins that were found in it Table (2). Phytochemical constituents such as tannins, saponins, flavonoids, alkaloids, and several other aromatic compounds are secondary metabolites of plants that serve as defense mechanisms against predation by many microorganisms, insects, and other herbivores. (Rehab, 2017; Chung et al., 1993). Therefore, in order to obtain effective antimicrobial activity at low concentrations without any side effects on the health researches should focus on the optimization of purification and applications. Also it can act as growth promoter through its effects by increasing activity of metabolic cycles because it contains Tannins (high molecular weight phenolic compounds) that have enough hydroxyl ions to bind feed nutrients (protein, carbohydrates and vitamins) and precipitate feed nutrients in tissues (Rehab, 2017; Chung et al.,1998).The bacteriostatic or bactericidal of tannin against Staphylococcus aureus. have been reported (Rehab, 2017; Sasikumar et al, 2005). The mechanisms of tannin antimicrobial activity can be explained briefly as follows. (i) Many microbial enzymes have been inhibited by tannin astringent property. (ii) A tannin’s can cause microbial membrane toxicity. (iii) This toxicity due to metal ions produced by tannin (Rehab, 2017; Alkhazaragi,1991). So it could be concluded that Acacia ehrenbergiana Hayne extract possess remarkable antibacterial activity against gram positive and gram negative bacteria as grazing herband to be introduced as promising an alternative to chemical antimicrobial drugs, is required wider investigation .These results supported the claimed use of this herb as a rich grazing pasture for animals. However, it is necessary to justify the safe use of these herbal drugs through the detailed fractionation, toxicity and determination of the active constituents. •	Abd El-Latif SA, Faten AI, El-Kaiaty AM (2002). Effect of feeding dietary thyme, black cumin, dianthus and fennel on productive and some metabolic responses on growing Japanese quail. Egypt. Poult. Sci. 22: 109-125. •	Ajoku GA, Ugbabe GE, Kalpana J (2015). Foliar Ultra-Structure and Antimicrobial screening of the Leaf Extracts of Panicum maximum Jacq. (Family: Poaceae/Graminae) Scholarly J. Biol. Sci. 4(3): 19-22. •	AlKhazaragi SM (1991)Biopharmacological study of Artemisia herba alba. MSC. Thesis. Univ. Baghdad. •	Beuchat LR, DA Golden (1989). Antimicrobials occurring naturally in foods. J. Food Technol. 43:134-142. •	Contu S (2012). “Acacia ehrenbergiana”. IUCN Red List of Threatened Species. Version 2012.2. International Union for Conservation of Nature. Retrieved 2013-04-02. •	Duraipandiyan V, Ayyanar M, Ignacemuthu S (2006). Antimicrobial Activity of Ethnomedicinal Plants used by Palyar Tribe from Tamil Nadu India. Complement. Alternat. Med. 635. •	Kanife UC (2011). Potentials of alkaloids from Panicum maximum florets infected with the fungus Tilletia ayresii in controlling uterine contraction in Sprague- dawley rats, Ph.D Thesis University of Lagos, 181. •	Larhsini M, Oumoulid L, Lazrek HB, Wataleb S, Bousaid M, Markouk M, Jana M (1999). Screening of antibacterial and antiparasidic activities of six Moroccan medicianal plants. Therapie. 54 (6): 763-765. •	Mahon CR, G Manuselis (1995). Textbook of diagnostic microbiology. W.B. Saunders, Pennsylvania. •	Merck Sharp, Dohme Corp. Diarrhea in Neonatal Ruminants Copyright © 2010-2014. A subsidiary of Merck & Co. Inc. Whitehouse Station NJ, U.S.A.
•	Okokon JE, Anwanga EU, Samuel GF, Nsikak MU (2011). Anti inflammatory and Antipyretic Activities of Panicum maximum. Afri. J. Biomed. Res. 14: 125-130. •	Parastoo Karimi Alavijeh, Parisa Karimi Alavijeh, Devindra Sharma (2012). A study of antimicrobial activity of few medicinal herbs. Asian J. Plant Sci. Res. 2: 496-502. •	Rehab Mohammed Atta ElDesoukey (2015). ( Phytochemical and Antimicrobial Activity of Salvadora persica (Miswak) against Some Animal Pathogens.) Asian Acad. Res. J. Multidisciplin. 2(6):199- 212 . •	Rehab Mohamed Atta El-Desoukey (2017). (Phytochemical and antimicrobial activity of panicum turgidum (thummam) as a grazing herb against some animal pathogens). EC Microbiology. 5.1: 22- 29. •	Schuh J, Weinstock D (2009) Bovine abortion caused by Bacillus cereus. J. Am. Vet. Med. Assoc. 1985 Nov 15. 187(10):1047-8.